Image Comics and Top Cow Productions are excited to announce the highly anticipated return of CYBER FORCE, in celebration of the title’s twentieth anniversary, in October 2012. Comics legend and Top Cow founder Marc Silvestri returns to the property that helped launch his company and Image Comics as co-writer, art director, and cover artist, spearheading his unique vision for the new series. And now, CYBER FORCE is embarking on a new path, using 21st century social media to make the first five issues (to be published monthly) available for free, both digitally and in print. A Kickstarter campaign launched on July 17, taking advantage of the year-long build-up of excitement for Image and Top Cow’s 20th anniversary. Rewards for backers of the Kickstarter campaign, which has a goal of $75,000, include exclusive variant covers, a signed print, a hardcover edition of the collected first five issues, a smartphone case, original art, and one-on-one sessions with Matt Hawkins and Marc Silvestri. There are also several special rewards for comic book retailers who pledge - including exclusive signings by Marc Silvestri! The funding will not only go toward paying the art team but also toward offsetting print costs, thus ensuring the first five issues are available for free. 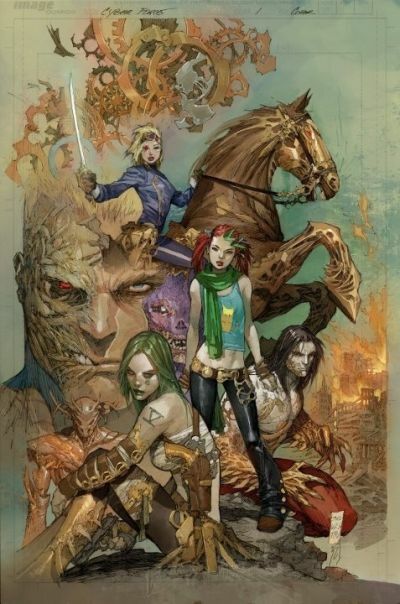 With an entire generation of fans who grew up on the series and new fans discovering Image and Top Cow every week, creator and Top Cow CEO Silvestri knew the time was right for CYBER FORCE to return. Joining Silvestri on the new series is interior artist Khoi Pham. Hot off of top-selling Marvel Comics titles including Avengers, Daredevil, The Mighty Thor, and X-Men, Pham’s art will bring to life this bold new vision of CYBER FORCE. The new series will appeal to fans of the original, as well as reach out to a wider audience by creating a cutting-edge world based on real technology. Co-writer and Top Cow President Matt Hawkins (THINK TANK, THE TEST) will utilize his background in science to lead the series in a never-before-seen direction.